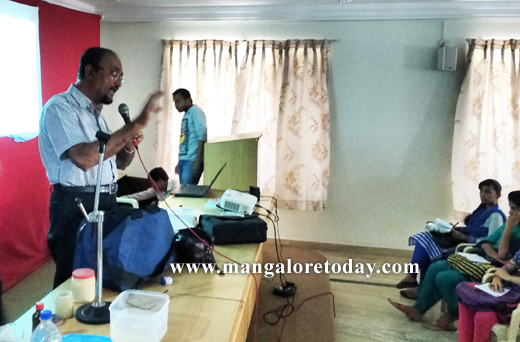 Mangaluru, January 23, 2017: Aid Without Religion Trust and DK Rationalists Association jointly organized a one day workshop on Developing Scientific Temper on Sunday, 22nd January. KBEA Auditorium, Bijai was the venue for the workshop. About 80 persons, mostly youth leaders and volunteers attended workshop. Prof. Narendra Nayak, President of Federation of Indian Rationalists Associations, senior psychiatrist Dr. K. S. Madhava Rao and eminent physician and columnist Dr. B. Srinivas Kakkilaya were the chief resource persons for the workshop. Dr. K. S. Madhava Rao briefed the participants on scientific method. He gave a psychological perspective of human behaviour and perception. He illustrated his talk with many examples of alleged supernatural happenings which he had investigated and found to have perfectly normal explanation. 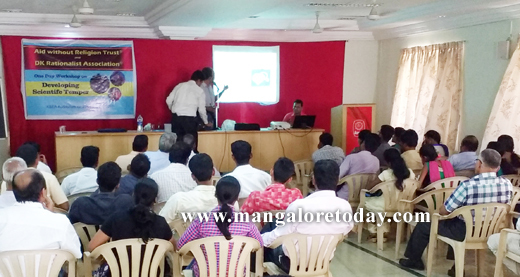 Dr. B. Srinivas Kakkilaya spoke on scientific approach in medical field. He introduced the idea of evidence based medicine and also spoke on various alternative medicines which lack scientific basis. He answered many questions from the delegates. Prof. Narendra Nayak gave a demonstration on so-called miracles and explained them scientifically. He showed how people get fooled by fraudulent god men, astrologers and others who make extravagant claims and lure gullible people. The workshop concluded with a discussion on taking the movement forward and propagating scientific values in society. Registration was free. Delegate handouts, lunch and refreshments were served to the participants. A book exhibition on scientific temper and rational thinking was a part of the event.